When a pair of British entrepreneurs came together in 1999, they conspired to radically alter the world of online sportsbetting. They devised a website where players would not compete against the house or a bookie, but instead against each other. Anyone making a wager would be anonymously matched up with another gambler betting the other way. 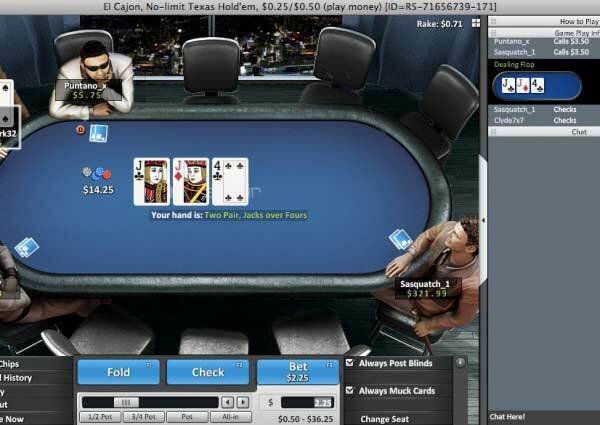 In a few short years it had exploded into a hugely popular operation and with such a solid gaming foundation it was inevitable that they would branch out into online poker. Betfair has transferred their enthusiasm and sense of fair play successfully into the world of poker, especially given their recent move to the popular Ongame Network. If you were in any doubt about Betfair’s quality, a glance at their two Queen’s Awards for Enterprise in 2003 and 2008 should allay any concerns. After years of treading water on its own private network, Betfair has recently made the transition to the Ongame network, boosting the sites player base by as much as five times, around the clock. The software now supports No Limit, Pot Limit, and Limit Hold ‘em, Pot Limit Omaha and Draw and Stud games. The stakes for Hold ‘em start very low at $0.02 – $0.04 and move up to $250/$500 for No Limit. This is a good spread, that should cover almost every bankroll. Most sites have a massive skew towards the micro and low stakes, but Betfair poker has fairly even numbers all the way up to $0.50/$1. As with Betfair’s cash games, there’s a surprisingly even spread of players across the different stakes. Rather than packing all their players into the low buy-in tables, there tend to be a small number of games running at stakes up as high as $100 + $8. The $0.11 to $8 buy-in games are still the most popular, but the action is not as biased towards these lower limits as you might normally expect. MTTs on Betfair are even better than S&Gs, with a good handful of well attended tournaments running off-peak. These events are well attended due to the large and ever-growing array of guaranteed prize pools. At times it seems like almost every Betfair MTT features some form of added money or guaranteed prize pool. There are numerous tournaments with between $100 – $35,000 guaranteed every day, many of which don’t draw the big fields you might expect. The biggest tournament of every day is the $50 + $4 European Rebuy $35,000 guarantee, running Monday-Friday. If you’re worried that leaves you with nothing to do on the weekends, then the $190 + $10 Sunday tournament with a massive $200,000 guarantee may be for you. Since the move to the Ongame network, Betfair boasts new guaranteed prize pools, better software, more game variety, more players, and an exciting new VIP program. As people play at Betfair they will collect player points which can be turned into great rewards. Betfair has really stepped it up in recent times, and is well worth checking out. When Betfair made the jump to the Ongame network, they left behind their old cluttered software, and took on board a new slick interface. If you’ve played on other Ongame sites before, then you’ll be familiar with the client, but if not you should really check it out as it rivals all other poker software out there. The downloadable client runs on both Mac and Windows, so nobody needs to miss out. When you open the lobby, you will be greeted with the simplest system imaginable. Simple choose the game type, the stakes and the number of seats you are looking for, and then the glowing Play Now button will take you to a table that fits that description. If you want more control then all tables are also viewable through a series of tabs which gradually filters games by type, stakes, seats etc. One really cool feature about the lobby is that when a table is selected, you will see a graphical representation of it showing who is sitting where, and which seats are free. From here, you can pick your ideal seat and let play commence. 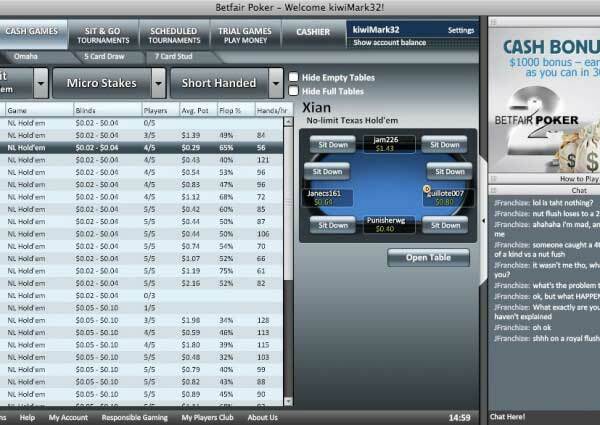 The tables are perhaps Betfair’s strongest element, when it comes to interface and visual appeal. They are very clean and clear, with the cards, chips, and bet amounts all instantly readable. There is a chat box on the right-hand side of the table window, which can be shown or hidden at will. The buttons and bet slider are all very functional, and there are additional options such as automatically posting blinds which can be toggled right from the table, making it a very intuitive interface which is also easy to customize. Further to the great table interface is the fact that multi-tabling has no cap on Betfair. That is, players can open and sit at as many tables as their brain and computer can handle, without the software interfering in the slightest. This is a great feature for a serious grinder, and can be a lot of help in clearing bonuses. Sadly U.S. players are not currently permitted at Betfair, thanks to the unquestionably evil UIGEA. Betfair has a reputation in the UK as an excellent sportsbook and they have been able to build on this reputation with their online poker client. As such Betfair has always had a solid, if somewhat modest, player base. Recently, however, they have moved onto the Ongame network, increasing their traffic by a factor of five, and placing them up amongst the poker rooms which are definitely worthy of note. It would not come as a major shock if most of the players on Betfair were found at the low-stakes No Limit Texas Hold ‘em cash games. However, they aren’t all stuck there. There’s a surprisingly balanced spread of players all the way up to the mid stakes. It is certainly a more varied selection of stakes than you‘ll find on other small networks. Their MTTs are quite popular, largely thanks to the tens of thousands of dollars they provide in guaranteed tournaments every day. Betfair is first and foremost one of the world’s most popular online betting exchanges. Their innovative approach of laying odds and combative wagering draws in eager sports bettors from around the globe. This is great for poker players, as many of these gamblers will transition over into the poker room. Big sports winners arrive in the poker room with fat wallets and very little skill. Their recent switch to the Ongame network has helped the fish situation even further, by vastly expanding their player base. While the merger has of course brought a lot more regular players, there are definitely plenty of fish to go around. You can expect some pretty high average pot sizes if ring game tables are your thing, especially during peak hours. Tournaments on betfair have always had a great reputation due to their high guarantees, and tournament players on Ongame have been considered to be among the worst, with a much higher percentage of players busting in the first hour of tournaments than on other sites. These days you get the best of both these worlds, meaning the high guarantees of tournaments attract a great deal of dead money and should be fairly easy pickings. By using our links and entering the Betfair Poker promo code PKRREG when creating your new account at Betfair, you’ll qualify for a 200% up to €1,500 Deposit Bonus. The bonus is also available up to a maximum of $2,000 or £1,200 depending on what currency you choose to keep your poker account in. Simply make your first deposit of at least €10 or more, and your bonus funds will be credited to your account. In order to clear the bonus, you’ll have to earn 1,250 Status Points for every €10 piece of the bonus. You’ll have 45 days from the date of your deposit to earn as much of the bonus as you can. After this period, the unearned bonus portions will be forfeit. Gather Status Points at the rate of 25 for every € and 30 for every £ you pay in cash game rake or tournament fees. This large bonus is only part of the Betfair Poker Welcome Pack. You’ll also get 5 x €1 tokens into special “Rookie Tables” SNGs, 5 x €1 tokens to enter any tournaments in the “featured” tab of the poker lobby, €5 to use in the Betfair casino, and 5 Big Win Access tokens that give you the opportunity to satellite into big events for free. As a depositor, you’ll be able to enter a weekly €25,000 Depositors freeroll. As if these rewards weren’t enough, Betfair also maintains a 13-tiered VIP Club. As you earn more and more Status Points, your rank will increase. You’ll gain a multiplier the higher you climb that will award you VIP Player Points for every Status Point you earn. You can cash out these VIP points for cash placed directly in your account. Get up to 50% cashback at the higher VIP tier! The sportsbook at Betfair is truly one of a kind. In your typical online (or live) sportsbook the player gambles solely against the house. In this scenario the house sets the line and the vig (or rake) and the player has to use those odds to gamble. What Betfair has done is taken out the middle man. Instead of the house setting the lines/odds, the players at Betfair do so. You can create lines on certain games or accept lines/odds from other players. This is a great way to gamble and is a great idea for those who truly know a lot about sportsbetting. Betfair does charge a small commission for placing bets, but as your volume increases, you will barely notice! There are many types of games you can wager on at Betfair. The more popular sports include: soccer, American football, basketball, and cricket. Currently the minimum wager is £2 and there does not appear to be a set maximum. It truly is up to you and other players on what amount you will wager and at what odds. Unfortunately at this time the sportsbook at Betfair does not accept US players, but they still accept wagers on sporting events played on American soil. Before you begin betting at the Betfair sportsbook you should take advantage of their £25 free bet for new members. Just enter the promotional code BET234 when creating your account and you will receive a free £25 bet. The only stipulation is you must deposit with in 21 days of signing up. If your first bet loses you will receive up to £25 in your account with in 48 hours. Many of the issues and concerns you might have with Betfair are cleared up in their large FAQ. It can take a bit of digging to find what you’re after, but most basic questions have been considered and thoroughly answered. When you have a more complicated query, it’s often best to take it straight to a support representative. There’s a dedicated poker email service that, in my experience, dealt with any problems pretty quickly. They also provide a phone number so you can get in touch that way if you prefer. A nice touch is the support forum, so users can help out other users or check if their problem has already been solved by somebody else.